As we finalize plans to attend the Medical Fitness Association Conference (MFA) in Orlando Florida and present Strength Conditioning for Individuals with intellectual, cognitive and developmental disabilities”, I remember the first discussions our trainers and friends had about designing a piece of fitness equipment to make specific strength and cardio exercises easier to perform for clients with disabilities. Eventually the ideas and dreams created a real sense of urgency to customize a piece of equipment for just that purpose. This led us to work with an engineer and my brother-in-law, a welder by trade, and who put all the pieces together in his backyard garage in Pittsburgh, Pennsylvania. Once completed we officially named this piece of equipment, “The Slider”, so as to recognize its basic functional feature of sliding across the floor. What could be more perfect than inventing this unique piece of iron and steel in the hometown of the Pittsburgh Steelers, and once headquarters of U.S. Steel. “The Slider” continues to be a topic of proud conversation at Right Fit with our clients and staff. I can’t describe the feeling when I hear our clients Nick and Tommy, who have Autism, recite their exercise routine “Slider ten times Suzanne” and Ed, who has Alzheimer’s. stand taller and with a better sense of balance as he pushes this mighty piece of equipment back and forth along Right Fit’s 40 yards of turf. 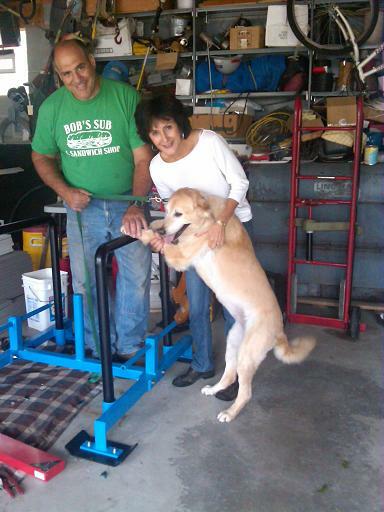 Since Lucky (my golden retriever) and I picked up “The Slider” two months ago, it’s even more obvious why parents, spouses, relative and other clients are smiling as they observe it in action. I believe “The Slider” will continue to earn a special reputation and exercise notoriety as it assists individuals with and without disabilities increase their strength and endurance. Whether it’s a building, automobile, or piece of exercise equipment, lets not take for granted the power, energy and confidence one feels by moving steel. Even “The Sliders” calming blue color offers hope and the potential to help others move and feel better.